The Science of Mechanics: A Critical and Historical Exposition of its Principles is an 1893 Thomas J. McCormick translation of the second German edition of Ernst Mach's original 1883 Die Mechanik in ihrer Entwickelung (Mechanics and Its Evolution). It is not a treatise upon the application of the principles of mechanics. Its aim was to clear up ideas, expose the real significance of the matter, and get rid of metaphysical obscurities. The little mathematics it contains is merely secondary to that purpose. Mechanics was treated, not as a branch of mathematics, but as a physical science. Its reader was expected to acquire therein, some enlightenment on the principles of mechanics: how they were ascertained, their sources of the origin, and how far they might be regarded as permanent. Mach maintained that all of this, the positive and physical essence of mechanics, was buried and concealed beneath a mass of technical considerations in the extant treatises of his time. The gist and kernel of mechanical ideas has in almost every case grown up in the investigation of very simple and special cases of mechanical processes; and the analysis of the history of the discussions concerning these cases must ever remain the method at once the most effective and the most natural for laying this gist and kernel bare. Indeed, it is not too much to say that it is the only way in which a real comprehension of the general upshot of mechanics is to be attained. I have not in every case been able to avoid the use of the abbreviated and precise terminology of mathematics. To do so would have been to sacrifice matter to form; for the language of everyday life has not yet grown to be sufficiently accurate for the purposes of so exact a science as mechanics. The elucidations which I here offer are, in part, substantially contained in my treatise, Die Geschichte und die Wurzel des Satzcs von der Erhaltung der Arbeit (...1872). At a later date nearly the same views were expressed by Kirchhoff (Vorlesungen über mathematische Physik: Mechanik, Leipsic, 1874) and by Helmholtz (Die Thatsachen in der Wahrnehmung, Berlin, 1879), and have since become commonplace enough. Still the matter, as I conceive it, does not seem to have been exhausted, and I cannot deem my exposition to be at all superfluous. The questions here dealt with have occupied me since my earliest youth, when my interest for them was powerfully stimulated by the beautiful introductions of Lagrange to... his Analytic Mechanics, as well as by the lucid and lively tract of Jolly, Principien der Mechanik (...1852). If Duehring's estimable work, Kritische Geschichte der Principien der Mechanik (...1873), did not particularly influence me, it was that at the time of its appearance, my ideas had been... published. ...[T]he reader will... find many points of agreement between Dühring's criticisms and those here expressed. The new apparatus for the illustration of the subject, here figured and described, were designed entirely by me and constructed by Mr. F. Hajek... In less immediate connection with the text stand the fac-simile reproductions of old originals in my possession. The quaint and naive traits of the great inquirers, which find in them their expression, have always exerted upon me a refreshing influence in my studies, and I have desired that my readers should share this pleasure with me. That branch of physics which is at once the oldest and the simplest and which is therefore as introductory to other departments of this science, is concerned with the motions and equilibrium masses. It bears the name of mechanics. The history of the development of mechanics, is... indispensable to a full comprehension of the science in its present condition. It also affords a simple and instructive example of the processes by which natural science generally is developed. An instinctive, irreflective knowledge of the processes of nature will doubtless always precede the scientific, conscious apprehension, or investigation, of phenomena. The former is the outcome of the relation in which the processes of nature stand to the satisfaction of our wants. The acquisition of the most elementary truth does not devolve upon the individual alone: it is pre-effected in the development of the race. [I]t is necessary to make a distinction between mechanical experience and mechanical science... If we carefully examine the ancient Egyptian and Assyrian monuments, we shall find there pictorial representations of many kinds of implements and mechanical contrivances... long before theory was dreamed of, implements, machines, mechanical experiences, and mechanical knowledge were abundant. In the infinite variety of nature many ordinary events occur; while others appear uncommon, perplexing, astonishing, or even contradictory to the ordinary run of things. As long as this is the case we do not possess a well-settled and unitary conception of nature. Thence is imposed the task of... seeking out... those elements that are the same, and... ever present. By this means, on the one hand, the most economical and briefest description and communication are rendered possible; and on the other, when once a person has acquired the skill of recognising these permanent elements throughout the greatest range and variety of phenomena... this ability leads to a comprehensive, compact, consistent, and facile conception of the facts. When... we are everywhere able to detect the same few simple elements, combining in the ordinary manner, then they appear to us as things... familiar... in the phenomena, we feel at home with them, they no longer perplex us, they are explained. It is a process of adaptation of thoughts to facts with which we are here concerned. We now propose to enter more minutely into subject of our inquiries, and at the same time, without making the history of mechanics the chief topic discussion, to consider its historical development so far as this is requisite to an understanding of the present state of mechanical science... Apart from the consideration that we cannot afford to neglect the great incentives that it is in our power to derive from the foremost intellects of all epochs, incentives which taken as a whole are more fruitful than the greatest men of the present day are able to offer, there is no grander, no more intellectually elevating spectacle than that of the utterances of the fundamental investigators in their gigantic power. Possessed as yet of no methods, for these were created by their labors, and are only rendered comprehensible to us by their performances, they grapple with and subjugate the object of their inquiry, and imprint upon it the forms of conceptual thought. They that know the entire course of the development of science, will, as a matter of course, judge more freely and more correctly of the significance of any present scientific movement than they, who limited in their views, to the age in which their own lives have been spent, contemplate merely the momentary trend that the course of intellectual events takes at the present moment. [E]very enlightening progress made in science is accompanied with a certain feeling of disillusionment. We discover that that which appeared wonderful to us is no more wonderful than other things which we know instinctively and regard as self-evident; nay, that the contrary would be much more wonderful; that everywhere the same fact expresses itself. Our puzzle turns out then to be a puzzle no more; it vanishes into nothingness, and takes its place among the shadows of history. The principle of the parallelogram of forces, at which Stevinus arrived and employed, (yet without expressly formulating it,) consists... of following truth. If a body A (Fig. 26) is acted by two forces whose directions coincide with the AB and AC, and whose magnitudes are proportional the lengths AB and AC, these two forces produce the same effect as a single force, which acts in the direction of the diagonal AD of the parallelogram ABCD and is proportional to that diagonal. We arrive at the idea of time, —to express it briefly and popularly, —by the connection of that which is contained in... our memory with that which is contained in... our sense-perception. When we say that time flows on in a definite direction or sense, we mean that physical events generally (and therefore also physiological events) take place only in a definite sense. Differences of temperature, electrical differences, differences of level generally, if left to themselves, all grow less and not greater. ...In all this there is... a peculiar and profound connection of things. To demand at... present... a full elucidation of this matter, is to anticipate, in the manner of speculative philosophy, the results of all future special investigation, that is a perfect physical science. Newton has... acted contrary to his expressed intention only to investigate actual facts. No one is competent to predicate things about absolute space and absolute motion; they are pure things of thought, pure mental constructs, that cannot be produced in experience. All our principles of mechanics are... experimental knowledge concerning the relative positions and motions of bodies. ...No one is warranted in extending these principles beyond the boundaries of experience. ...[S]uch an extension is meaningless, as no one possesses the requisite knowledge to make use of it. It might be... that... motion is determined by a medium... In such a case we should have to substitute this medium for Newton's absolute space. ...[I]t is easily demonstrable that the atmosphere is not this motion-determinative medium. We should, therefore, have to picture to ourselves some other medium, filling, say, all space, with respect to... which... we have at present no adequate knowledge. In itself such a state of things would not belong to the impossibilities. It is known, from recent hydrodynamical investigations, that a rigid body experiences resistance in a frictionless fluid only when its velocity changes. ...[T]his result is derived theoretically from the notion of inertia; but it might... also be regarded as the primitive fact from which we... start. ...[W]e might... hope to learn more in the future concerning this hypothetical medium; and from the point of view of science it would be in every respect a more valuable acquisition than the forlorn idea of absolute space. Let us... examine the point on which Newton, apparently with sound reasons, rests his distinction of absolute and relative motion. If the earth is affected with an absolute rotation about its axis, centrifugal forces are set up in the earth: it assumes an oblate form, the acceleration of gravity is diminished at the equator, the plane of Foucault's pendulum rotates, and so on. All these phenomena disappear if the earth is at rest and the other heavenly bodies are affected with absolute motion round it, such that the same relative rotation is produced. This is, indeed, the case, if we start ab initio from the idea of absolute space. But if we take our stand on the basis of facts, we shall find we have knowledge only of relative spaces and motions. 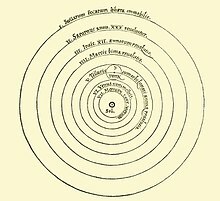 Relatively, not considering the unknown and neglected medium of space, the motions of the universe are the same whether we adopt the Ptolemaic or the Copernican mode of view. Both views are, indeed, equally correct; only the latter is more simple and more practical. The universe is not twice given, with an earth at rest and an earth in motion; but only once, with its relative motions, alone determinable. It is, accordingly, not permitted us to say how things would be if the earth did not rotate. We may interpret the one case that is given us, in different ways. If, however, we so interpret it that we come into conflict with experience, our interpretation is simply wrong. The principles of mechanics can, indeed, be so conceived, that even for relative rotations centrifugal forces arise. The comportment of terrestrial bodies with respect to the earth is reducible to the comportment of the earth with respect to the remote heavenly bodies. If we were to assert that we knew more of moving objects than this their... experimentally-given comportment with respect to the celestial bodies, we should render ourselves culpable of a falsity. When, accordingly, we say, that a body preserves unchanged its direction and velocity in space, our assertion is nothing more or less than an abbreviated reference to the entire universe. The use of such an abbreviated expression is permitted the original author [Newton, Descartes or Galileo] of the principle, because he knows, that as things are no difficulties stand in the way of carrying out its implied directions. But no remedy lies in his power, if difficulties of the kind mentioned present themselves; if, for example, the requisite, relatively fixed bodies are wanting. When we reflect that the time-factor that enters into the acceleration is nothing more than a quantity that is the measure of the distances (or angles of rotation) of the bodies of the universe, we see that even in the simplest case, in which apparently we deal with the mutual action of only two masses, the neglecting of the rest of the world is impossible. Nature does not begin with elements, as we are obliged to begin with them. It is certainly fortunate... that we can, from time to time, turn aside our eyes from the over powering unity of the All, and allow them to rest on individual details. But we should not omit, ultimately, to complete and correct our views by a thorough consideration of the things which for the time being we left out of account. [W]ithin the short span of a human life and with man's limited powers of memory, any stock of knowledge worthy of the name is unattainable except by the greatest mental economy. Science itself, therefore, may be regarded as a minimal problem, consisting of the completest possible presentment of facts with the least possible expenditure of thought. The function of science... is to replace experience. Thus, on the one hand, science must remain in the province of experience, but, on the other, must hasten beyond it, constantly expecting confirmation, constantly expecting the reverse. Where neither confirmation nor refutation is possible, science is not concerned. Science acts and only acts in the domain of uncompleted experience. Every unbiased mind must admit that the age in which the chief development of the science of mechanics took place, was an age of predominantly theological cast. Theological questions were excited by everything, and modified everything. No wonder, then, that mechanics is colored thereby. Similarly, the notions of the constancy of the quantity of matter, of the constancy of the quantity of motion, of the indestructibility of work or energy, conceptions which completely dominate modern physics, all arose under the influence of theological ideas. During the entire sixteenth and seventeenth centuries, down to the close of the eighteenth, the prevailing inclination of inquirers was, to find in all physical laws some particular disposition of the Creator. Towards the close of the eighteenth century a remarkable change took place,–a change which was apparently an abrupt departure from the current trend of thought, but in reality was the logical outcome of the development indicated. After an attempt in a youthful work to found mechanics on Euler’s principle of least action, Lagrange, in a subsequent treatment of the subject, declared his intention of utterly disregarding theological and metaphysical speculations, as in their nature precarious and foreign to science. He erected a new mechanical system on entirely different foundations, and no one conversant with the subject will dispute its excellencies. All subsequent scientists of eminence accepted Lagrange’s view, and the present attitude of physics to theology was thus substantially determined. Newton never, despite his profound religiosity, mingled theology with the questions of science. … The same may be said of Galileo and Huygens. In fact, science can accomplish nothing by the consideration of individual facts; from time to time it must cast its glance at the world as a whole. But now, after a century has elapsed, after our judgment has grown more sober, the world-conception of the encyclopaedists appears to us as a mechanical mythology in contrast to the animistic of the old religions. Physical science does not pretend to be a complete view of the world; it simply claims that it is working toward such a complete view in the future. The highest philosophy of the scientific investigator is precisely this toleration of an incomplete conception of the world and the preference for it rather than an apparently perfect, but inadequate conception. Quotes include those about Mach's other editions, including the 1883 first edition, Die Mechanik in ihrer Entwickelung (Mechanics and Its Evolution or History of Mechanics). I am going to talk about what Leibniz and Ernst Mach said about time. ...you can put the Leibnizian/Machian idea into a theory of dynamics, into the way the universe works. ...And the bottom line is this: There is a great likelihood that time does not exist at all, that it is a redundant concept. ...Now for the famous reactions that any of you who have studied the philosophy of science will surely have encountered: The Leibniz-Clarke Correspondence and Ernst Mach's famous book on mechanics. Let me give you some quotations. Leibniz said: "I hold space to be something merely relative." ...His claim is ontological: only relative things exist. ...Only relative changes are real. ...Mach said very similar things many years later. Julian Barbour, "Time and the Deep Structure of Dynamics," Time and History (2006) pp. 133-135, ed., Friedrich Stadler, Michael Stöltzner, Proceedings of the 28th International Ludwig Wittgenstein Symposium, Kirchberg am Wechsel, Austria 2005. We must not be surprised... that... all physicists of the last century saw in classical mechanics a firm and final foundation for all of physics, yes, indeed, for all natural science, and that they never grew tired in their attempts to base Maxwell's theory of electromagnetism, which, in the meantime, was slowly beginning to win out, upon mechanics as well. Even Maxwell and H. Hertz, who in retrospect appear as those who demolished the faith in mechanics as the final basis of all physical thinking, in their conscious thinking adhered throughout to mechanics as the secure basis of physics. It was Ernst Mach who, in his History of Mechanics, shook this dogmatic faith; this book exercised a profound influence upon me in this regard while I was a student. I see Mach's greatness in his incorruptible skepticism and independence; in my younger years, however, Mach's epistemological position also influenced me very greatly, a position which today appears to be essentially untenable. Albert Einstein, Autobiographical Notes (1946) Tr. Paul Arthur Schilpp. My attention was drawn to Ernst Mach's Science of Mechanics by my friend Besso while a student, around the year 1897. The book exerted a deep and persisting impression upon me... owing to its physical orientation toward fundamental concepts and fundamental laws. [compare two masses by pushing them with the same force and comparing accelerations] is used, is an experimental fact and by no means a "philosophical truth" which can be derived from "intelligible principles." There was a possibility that experiments would show a change of mass caused by external circumstances. ...[T]oward the end of the nineteenth century, J. J. Thomson derived from Maxwell's electromagnetic field theory the result that mass points behave like particles with electric charges. In the twentieth century, the motion of fast electrically charged particles was systematically investigated... in the cyclotron. If electrostatic forces are acting in the direction of the actual velocity, high speed particles (i.e., with speeds comparable to the speed of light) obtain accelerations which are noticeably smaller than the accelerations of slow particles in the same electrostatic field. As the correspondence at the Einstein Archives at Princeton reveals, one of the young scientists deeply caught up in Mach's point of view was Michelange (Michele) Besso—Einstein's oldest and closest friend, fellow student, and colleague at the Patent Office in Bern, the only person to whom Einstein gave credit for help (manche wertvolle Anregung) when he published his basis paper on relativity in 1905. It was Besso who introduced Einstein to Mach's work [Science of Mechanics]. ...Besso remained a loyal Machist to the end. In his Science of Mechanics... Ernst Mach suspended... the classic formula of the law of inertia because he believed that... [this] had to be rethought. His famous studies of Newton's terminology (in particular... absolute space and absolute time)... led Mach to propose a new formulation in which gravitation appears as a function of the entire mass distribution of the universe. In this critical reconstruction... Mach believed that it had to be shown... that even the most firmly established concepts were merely auxiliary constructs... [which] give a provisional account of relations... between our experiences. And... we tend to forget that we were the ones who introduced our concepts... Mach demands that we... keep dissolving the most firmly established concepts and formulæ... so that we do not perceive them as something independent of ourselves and allow them to become obstacles to our knowledge. Elisabith Nameth, "Scientific Language and Picture Language. Otto Neurath on Visualisation in Social Sciences." Image and Imaging in Philosophy, Science and the Arts (2011) Vol. 2, p. 63, ed. Richard Heinrich, Elisabeith Nameth, Wolfram Pichler, David Wagner, Proceedings of the 33rd International Ludwig Wittgenstein Symposium, Kirchberg, 2010. Die Mechanik in ihrer Entwickelung (1883) Ernst Mach, 1st German edition.